To start off I would like to point out that I am not a psychologist nor a teacher – I am a mum. BUT I have noticed something – art is good therapy. Around Christmas we had a lot of changes. Nothing bad, just lots of things going on where there was no normal routine for the kids. Cakey became cranky and uncooperative which isn't really like her. Suggestions were shot down, nothing was fun, there was lots of whinging and dragging of feet. I set up some painting (which she loves) on a particularly cranky-pants morning. I stayed very quiet and doled out lots of paint and brushes. 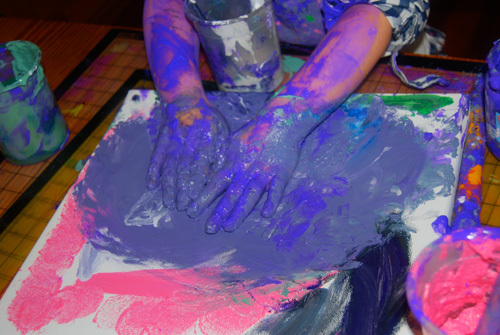 She painted with the brushes, then painted her hands, then her arms, then grabbed some nearby tissues and squelched them into the paper and canvas. 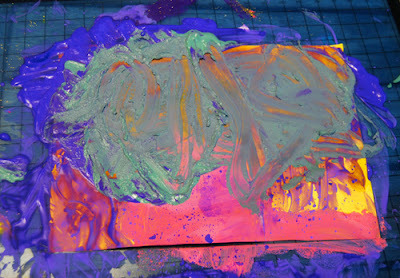 At one point she put her whole hand into the tub of paint and scooped it out. She seemed to be enoying massaging the paint into the canvas. I stayed mute the whole time – I didn't want to risk aggravating the cranky unsettled 3 year old! She painted like this for a long time. She only created two paintings on paper and one on canvas but there was a huge amount of paint on each (there was also a lot of paint on Cakey). None of these paintings were special to her and she paid no attention to them afterwards... but she was a lot more relaxed and a tad happier after the activity. Watching her massage the paint into the paper and canvas made me think she was using the art process as therapy. What was odd was that she was so quiet – usually her art and craft is peppered with commentary but this was all sensation and feel. It was quite remarkable to watch. Would you like some paper with your paint? What a wonderfully gooey way to let go of some tension. I knew a few adults who could use a painting day! Ha ha yes me too. 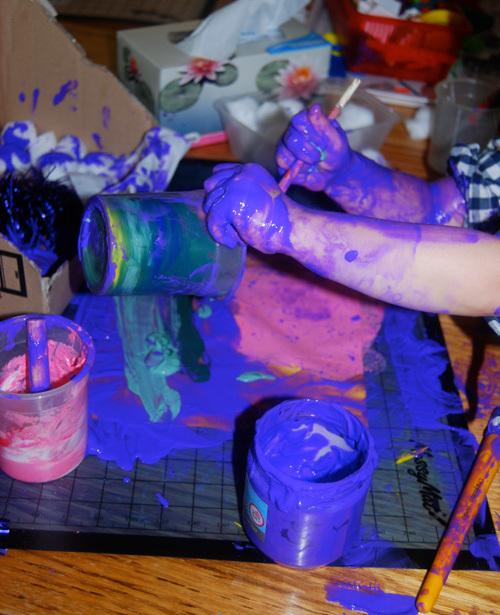 Alright, I love to see messy play. Kids have so much more fun when they can get messy. So true! My daughter calms down after painting every time. :) Love it! This looks like so much fun in addition to amazing therapy! Thanks for linking up over at PreKandKSharing! How could anyone no be soothed by the squishy smoothness of such a visceral and repetitive activity? At that point nothing really exists but the sensation, the being in the now. This would also be a great activity for anyone who can't get into meditation. Schools should devote one period a day to this; kids would be so much happier! It's a great form of therapy and self-expression.